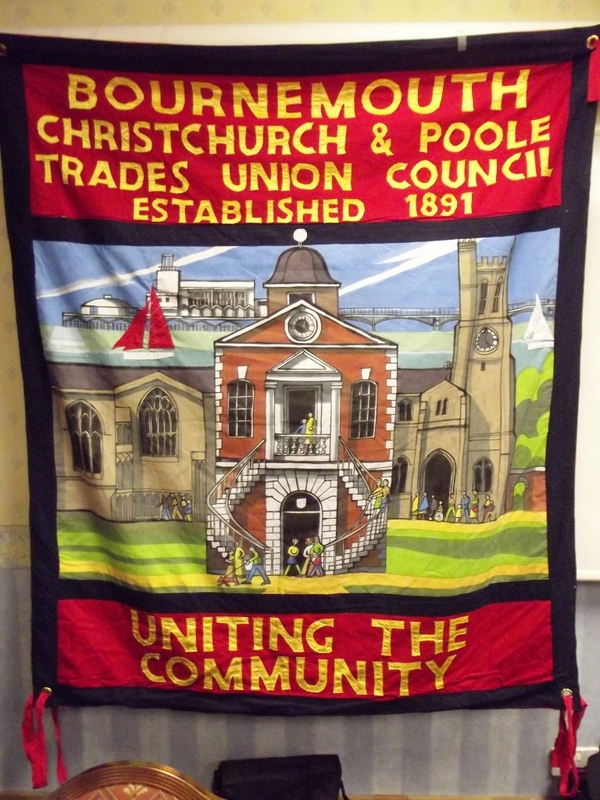 Welcome to the website of the Bournemouth, Christchurch and Poole Trades Union Council. Here you will find information about campaigns, meetings and other events that are being organised – along with materials and links to other useful websites. Today, the trade union movement is about much more than simply defending people’s rights at work. 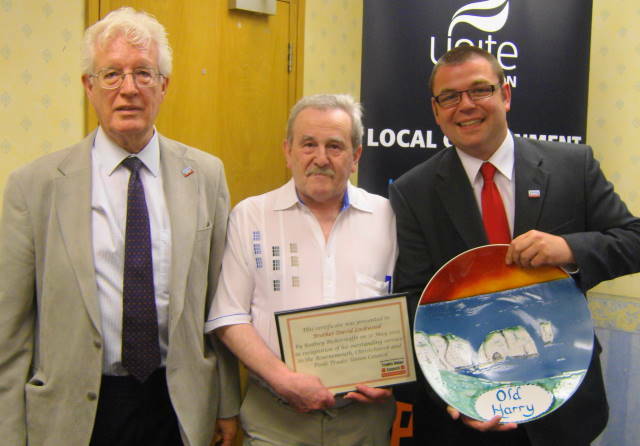 We aim to be the voice of working people – whether employed or unemployed – in the community. Our ability to influence and our effectiveness will be strengthened by ensuring that every trade union branch in the area is affiliated and actively involved in our work. Together we can provide a progressive alternative. Don’t just get angry – get organised! 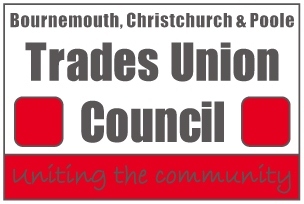 The Annual General Meeting of the trades council is open to all trade union delegates and will take place on Tuesday 30 January, 7pm, Unite office, Holdenhurst Road, Bournemouth. The meeting will hear from Dan Weissmann of Bournemouth University who will be presenting his initial findings into youth attitudes towards trade unionism, the communication challenges facing the movement and what can be done. A copy of the BCPTUC Annual Report for 2017 is available here: BCPTUC Annual Report 2017. Every year the Trades Council marks Workers Memorial Day as a way of remembering those who have died or been injured at work. 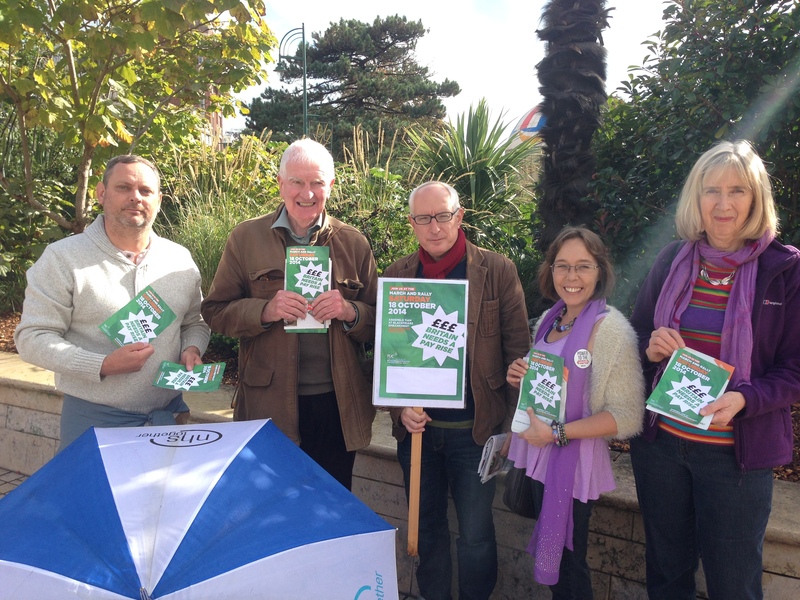 This year’s event took place in Poole Park with representatives from GMB, NUJ and Unite taking part. The gap between hourly earnings of union members and non-union members has widened to 21.6% in the public sector and 8.1% in the private sector. Around 6.4m employees in the UK were trade union members in 2014; broadly unchanged from the previous year. Once again, union membership levels rose in the private sector for the fourth consecutive year to 2.7m, and women outnumber men in terms of membership – with 3.55m women and 2.9m men belonging to the movement. Read the new pamphlet from CLASS on why immigration is good for society. It contains lots of useful facts and figures – just what you need to explode all the myths that exist surrounding this issue. Download a copy here. See a film of the action by Mark Rigler here. 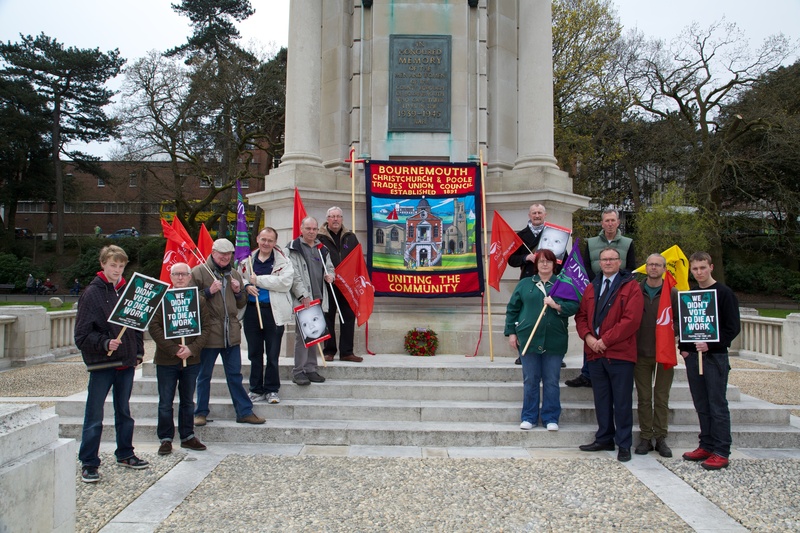 Members of the BCP TUC gathered on Workers’ Memorial Day (April 28) to remember those who had died whilst at work over the last year. A wreath was laid at the War Memorial in Poole Park. The trades council plans to put on a free coach to this event for local trades unionists, their families and friends. More details on pick up points, times and how to book a seat will be available shortly. Put the date in your diary. 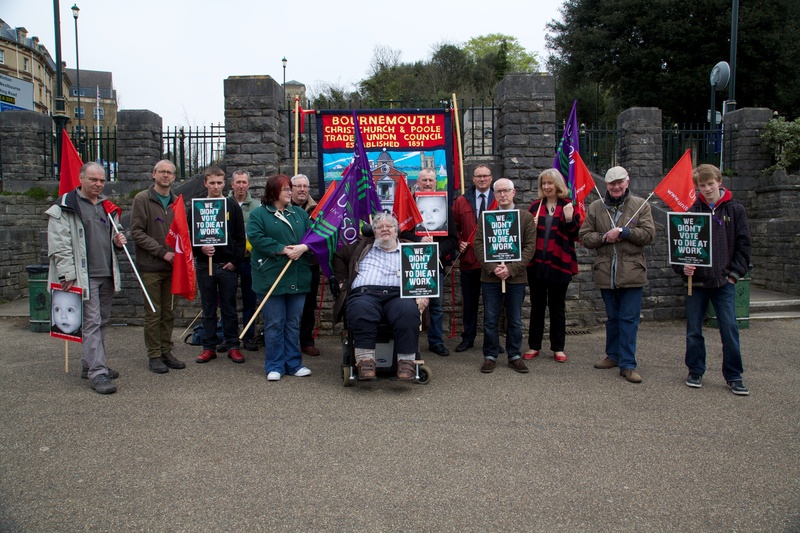 The Bournemouth, Christchurch and Poole Trades Union Council expresses its sadness at the sudden death of RMT leader, Bob Crow. He was always an active supporter of the trades council movement and has been described as one of the most successful general secretaries of his time. He will be sadly missed. Local MPs get the tax payer to fund their fuel bills! Local campaigners have welcomed today’s announcement that the Living Wage is to rise from £7.45 to £7.65 an hour. The announcement comes at the start of Living Wage Week, which aims to celebrate those employers that have signed up to pay their staff a higher wage. 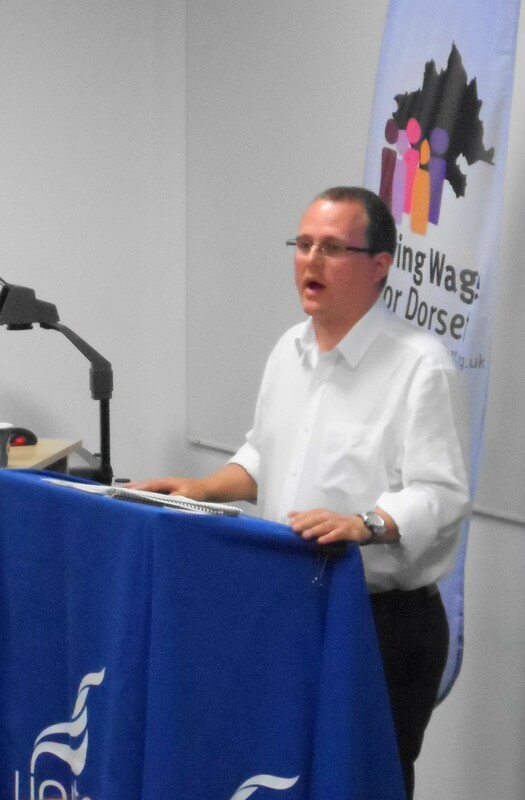 Over the next six weeks the Living Wage for Dorset campaign is embarking on a social media campaign, aimed at raising the profile of the issue amongst the public and securing more support. Campaigners are also in talks with leaders of political parties, faith groups and local businesses and hope to announce new living wage employers over the next few months. 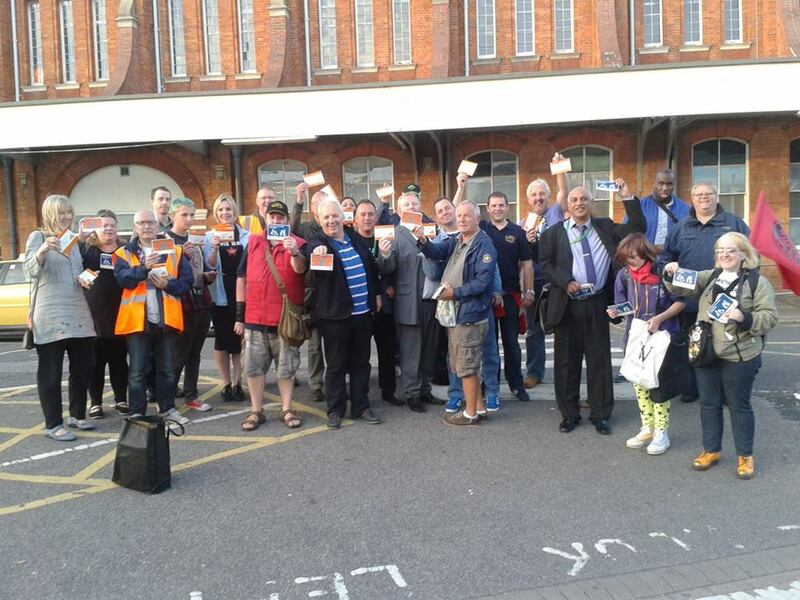 Members of the Trades Council joined the RMT to leaflet the public outside Bournemouth station at the beginning of September. The campaign is not only calling for more staff to be employed on stations to improve the safety and assistance to passengers, but also for the railway to be taken back into public ownership. 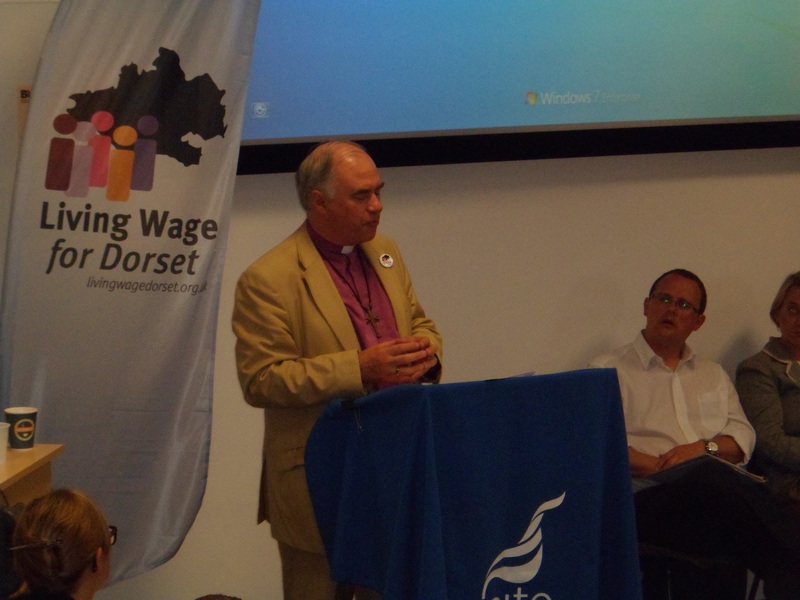 Over the last few weeks the trades council has been helping to launch the new Living Wage for Dorset campaign. Meetings have taken place in Bridport, Dorchester and Bounremouth and more are planned. 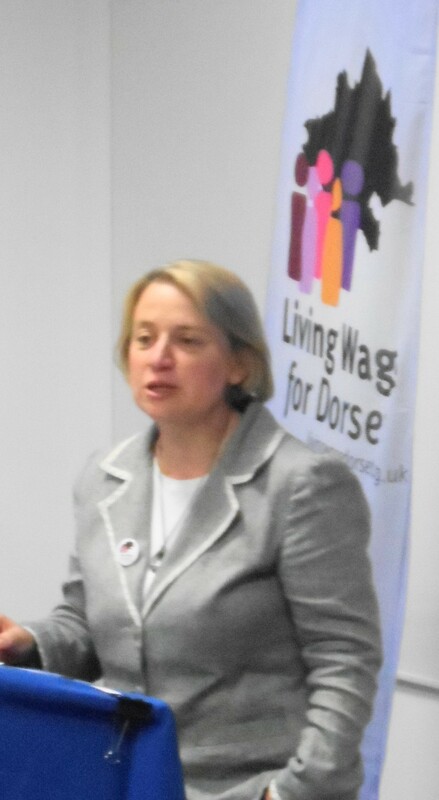 The Bournemouth event attracted a good crowd to hear Natalie Bennett, leader of the Green Party, Dr Graham Kings, the Bishop of Sherborne and Paul Nowak, Assistant Secretary of the TUC. Shortly the campaign wil launch its own website on http://www.livingwagedorset.org.uk. Visit it to find out more. 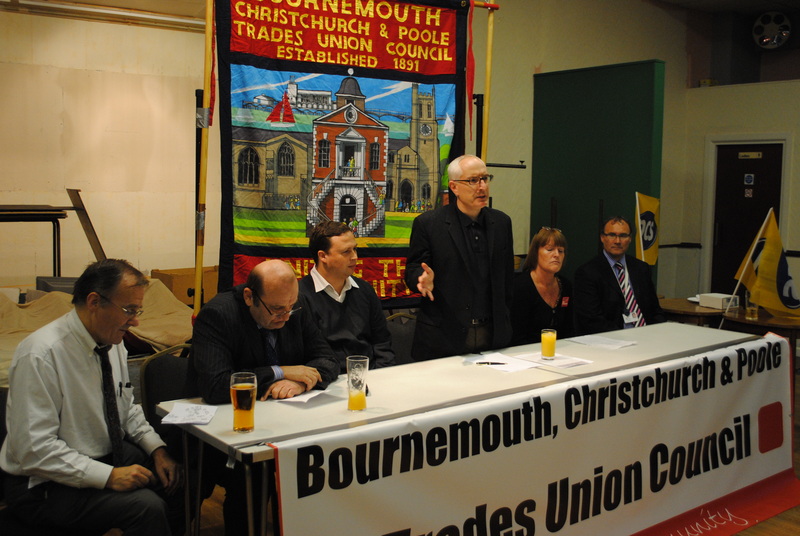 The next BCP TUC Business Meeting will take place on 18 December 2013, 7.30pm, Unite, 238 Holdenhurst Road, Bournemouth. Download a copy of the BCPTUC Annual Report 2012 here. Members of the BCPTUC held a short ceremony on 28 April 2013 to mark Workers’ Memorial Day. 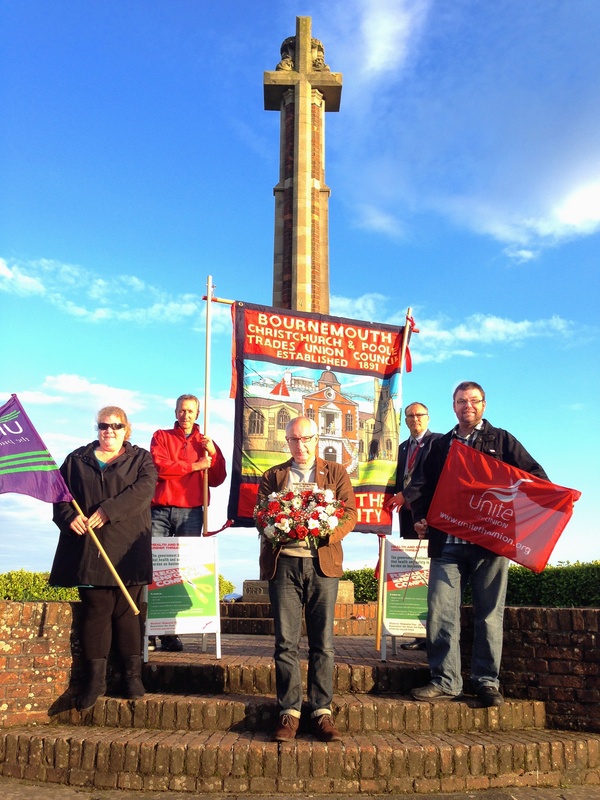 Campaigners gathered at the War Memorial in Bournemouth Centre Gardens, heard speeches, laid a wreath and held a minute’s silence in memory of all those who had died at work. The event was particularly poignant given the recent disaster in Bangladesh in a factory making clothes for UK outlets. The Government is planning to sell off Defence Support Group (DSG) which is dedicated to maintenance and repair of vehicles, weapons and communications systems for British Armed Forces’ as well as saving money through inventory management. This would affect workers at DSG Bovington. You can support the campaign against the sell-off by visiting http://www.unitetheunion.org/dsg. This April we’ve seen the Government hit some of the country’s most vulnerable families with the Bedroom Tax, cuts for legal aid and changes to disability benefits. Yet 13,000 millionaires are now getting a £100,000 tax cut. But that’s not enough for this Government. They have now ordered the Low Pay Commission to consider freezing, or even cutting, the National Minimum Wage, if the economy doesn’t pick up. Workers earning the lowest legal wage could be paying the price for this Government’s failed economic policies. All across our area, local trades unionists are under attack – threatened with changes to their terms and conditions or with privatisation and redundancy. Local PCS members at the Poole Magistrates Court staged an impromptu walkout on 30 November 2012 in opposition to plans to privatise their work. The Trades Council staged a successful open meeting on 28 September 2012 in support of the forthcoming TUC national demo. Speakers covered the South West NHS Pay Cartel dispute (See petition below) and the economic crisis (download an easy to read explanation and campaign briefing here. ). 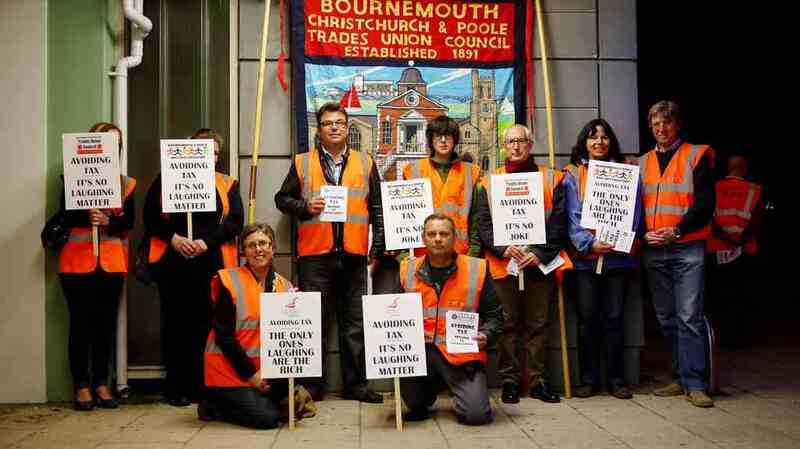 Members of the Trades Council and the local anti cuts group, BPACC, gave leaflets to the audience as they went into the Lighthouse Theatre, Poole to see comedian and tax avoider, Jimmy Carr perform on 21 September 2012. 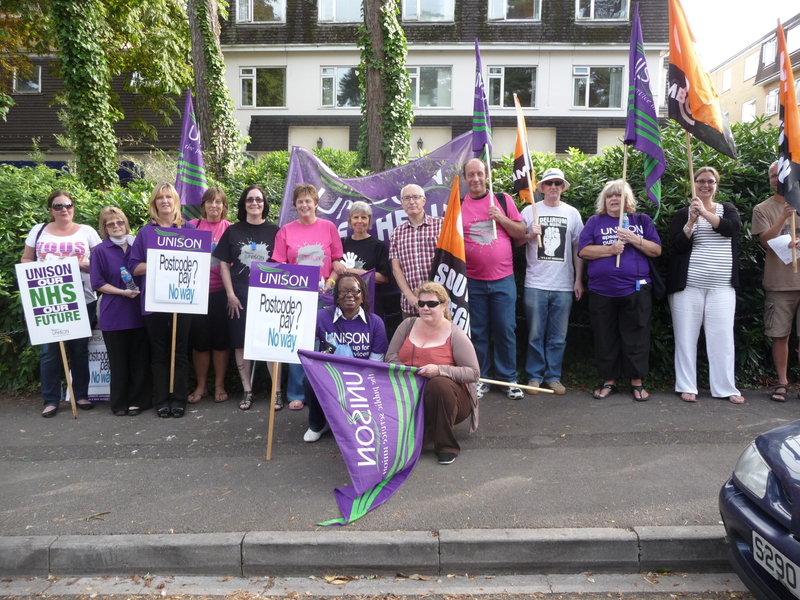 Members of Unison, GMB, Unite and other campaigners took part in a lobby of the Dorset Healthcare University Foundation Trust AGM outside the Carrington Hotel, Bournemouth on 6 September 2012 to protest over plans by 20 NHS Trusts to introduce new regional pay arrangements. The proposal is a serious threat to national pay bargaining and the TUC has pledged to defend workers’ terms and conditions. See Events page for details of future protests. You can also sign the campaign petition here. At its last meeting the BCP TUC pledged to oppose the government’s Workfare programme and has called on the Bournemouth and Poole College to withdraw its support from the scheme, after it emerged the college was encouraging employers on their website to “Try before they buy” – describing the unemployed as expendable commodities. Whilst the phrase has now been removed, the Work Programme still enables unscrupulous employers to use staff for up to three months without offering them any pay, formal training or travel expenses. Amid widespread controversy, a number of high street names have withdrawn their backing for the scheme, but attention has now turned to the local college. 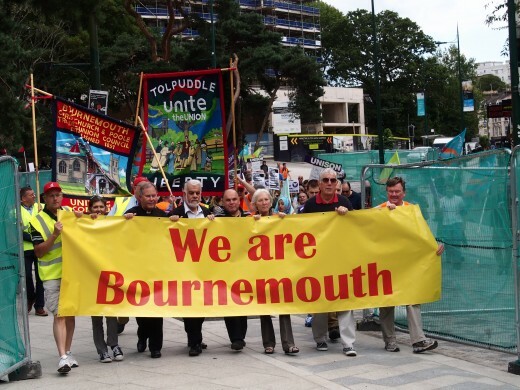 The local TUC and anti-cuts group, Bournemouth and Poole Anti Cuts Coalition (BPACC), plan to target the college with a wave of protests if it refuses to distance itself from the Work Programme. 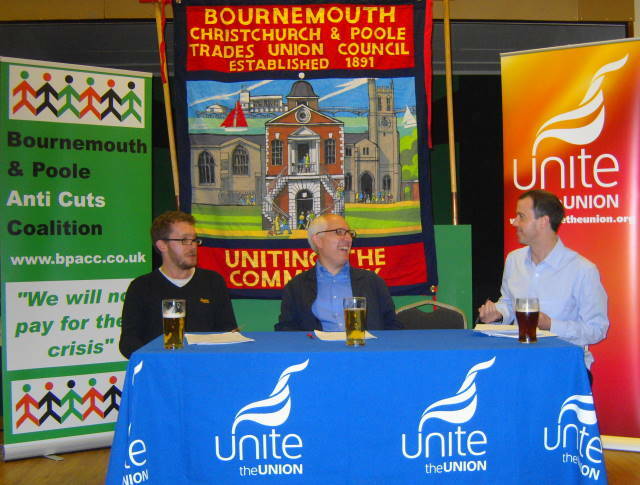 On 31 May the Trades Council staged a special Relaunch Meeting with guest speakers Nigel Costley (SW TUC) and Rodney Bickerstaffe. They both stressed the importance of trade councils and how they can build the social connections that will be necessary to create an alliance that can defeat the government’s austerity programme. To coincide with the relaunch the Trades Council has produced a badge – priced £1 and available on request – so that we can advertise our support for local trade unionism. Wear it with pride! The Trades Council organised a well supported Pre-Strike Solidarity Rally on 9 May, involving speakers from PCS, Unison and Unite.